We also manufacture queen and king sized pillow covers as well. Trust that Georgia Towels is here for you with whatever your textile needs should be! SINGLE PICK TIGHT WEAVE PROVIDES A SMOOTHER FEEL AND LONGER LIFE, QUITE BENEATH THE PILLOW COVER. 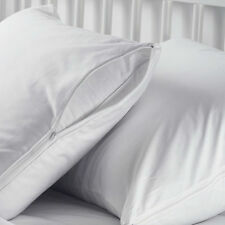 OUR PILLOW CASES FEATURE A DOUBLE LOCK HEM AND ARE STITCHED WITH CARE AND DURABILITY IN MIND. THESE PILLOW CASES ARE A COTTON BLEND FOR STRENGTH AND DURABILITY THROUGH REPEATED WASHING'S. OUR PILLOW CASES ARE DOUBLE HEM STITCHED FOR STRENGTH AND DURABILITY THROUGHOUT. 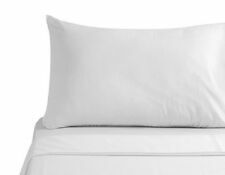 SOLID WHITE JERSEY KNITTED FITTED SHEET. Trust that Georgia Towels is here for you with whatever your textile needs should be! We have deeply embedded roots in the textile industry in the US. Textiles are in our blood sweat and tears. 2 KING ZIPPERED PILLOW PROTECTORS, PILLOW COVERS 20x36 in. 100% COTTON T-200. AND ARE OUR INDEPENDENTLY MANUFACTURED PILLOW CASES. 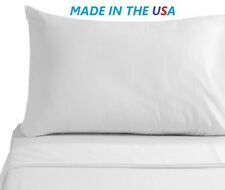 SINGLE PICK TIGHT WEAVE PROVIDES A SMOOTH FEEL AND LAST 3X LONGER THAN TRADITIONAL COTTON PILLOW CASES. Sheeting is advertised in "cut sizes", not finished sizes, therefore will vary. About a decade ago, we decided there was a need for change in the market. We have deeply embedded roots in the textile industry in the US. Queen Size Sheet XL Size With a Pair Of Pillowcase. Trust that Georgia Towels is here for you with whatever your textile needs should be! We have deeply embedded roots in the textile industry in the US. 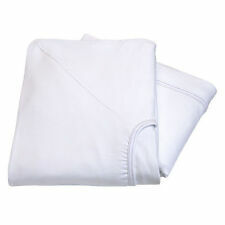 6 NEWTWIN XL 36X80X7 FITTED SHEETS WHITE 100% COTTON. Trust that Georgia Towels is here for you with whatever your textile needs should be! We have deeply embedded roots in the textile industry in the US. THESE QUILTED FITTED COVERS ARE PERCALE AND ARE VERY GOOD QUALITY T180. 60X80 AND ARE MADE FOR A QUEEN SIZED BED, AND FEATURE SUPER ABSORBENCY AND SOFTNESS TO PROTECT YOUR MATTRESS FROM DAILY WEAR AND TEAR, THUS MAKING YOUR LIFESPAN LONGER WITH PROTECTION AND DURABILITY. THESE CASES HAVE LUSTER AND A BRIGHT WHITE LOOK THESE SHEETS ARE MACHINE WASHABLE AND ARE BLEACH SAFE. 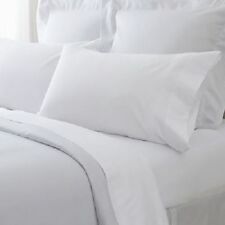 12 NEW SOLID WHITE QUEEN SIZE FLAT 20"X30" PILLOW CASES COMFORT FIT. Sheeting is advertised in "cut sizes", not finished sizes, therefore will vary. THESE CASES HAVE LUSTER AND A BRIGHT WHITE LOOK THESE SHEETS ARE MACHINE WASHABLE AND ARE BLEACH SAFE. 12 NEW SOLID WHITE STANDARD SIZE FLAT 20"X30" PILLOW CASES COMFORT FIT. Thick towels take much longer to wash and dry, and recirculate throughout the facility. 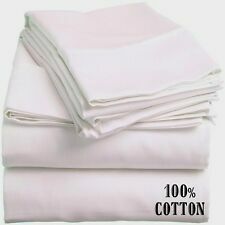 1 dozen white 100% cotton hotel absorbent 12x12 wash cloth buy 4 get 2 free !! Fabric 100% COTTON ABSORBENT BLEACH SAFE. About a decade ago, we decided there was a need for change in the market. Trust that Georgia Towels is here for you with whatever your textile needs should be! 3 out of 5 stars - 1 dozen white 100% cotton hotel absorbent 12x12 wash cloth buy 4 get 2 free !! 1 product rating1 product ratings - 1 dozen white 100% cotton hotel absorbent 12x12 wash cloth buy 4 get 2 free !! King Size Sheet XL Size With a Pair Of Pillowcase. Trust that Georgia Towels is here for you with whatever your textile needs should be! We have deeply embedded roots in the textile industry in the US. SOLID WHITE PERCALE COTTON FLAT SHEET. Trust that Georgia Towels is here for you with whatever your textile needs should be! We have deeply embedded roots in the textile industry in the US. Textiles are in our blood sweat and tears. Trust that Georgia Towels is here for you with whatever your textile needs should be! We have deeply embedded roots in the textile industry in the US. Textiles are in our blood sweat and tears. We believe hard work, a little southern hospitality, and the golden rule, are ways of life to live by! 78X80 AND ARE MADE FOR A KING SIZED BED, AND FEATURE SUPER ABSORBENCY AND SOFTNESS TO PROTECT YOUR MATTRESS FROM DAILY WEAR AND TEAR, THUS MAKING YOUR LIFESPAN LONGER WITH PROTECTION AND DURABILITY. THESE QUILTED FITTED COVERS ARE PERCALE AND ARE VERY GOOD QUALITY T180. Size: 54x80x12. We have deeply embedded roots in the textile industry in the US. Textiles are in our blood sweat and tears. We believe hard work, a little southern hospitality, and the golden rule, are ways of life to live by! GREAT QUILTED MATTRESS PROTECTORS. FLAT ABSORBENT MATTRESS COVERS. FULL SIZE BED , AND FEATURE SUPER ABSORBENCY AND SOFTNESS TO PROTECT YOUR MATTRESS FROM DAILY WEAR AND TEAR, THUS MAKING YOUR LIFESPAN LONGER WITH PROTECTION AND DURABILITY. COTTON T-200. Sheeting is advertised in "cut sizes", not finished sizes, therefore will vary. Think about the mill these towels are made in, and the amount of excess fibers and particulates in the air alone. THIS CASE HAS LUSTER AND A BRIGHT WHITE LOOK THESE SHEETS ARE MACHINE WASHABLE AND ARE BLEACH SAFE. 1 NEW SOLID WHITE STANDARD SIZE FLAT 20"X26" PILLOW CASES COMFORT FIT. Trust that Georgia Towels is here for you with whatever your textile needs should be! THESE FLAT COVERS ARE PERCALE AND ARE VERY GOOD QUALITY T180. 60X80 AND ARE MADE FOR A QUEEN SIZED BED, AND FEATURE SUPER ABSORBENCY AND SOFTNESS TO PROTECT YOUR MATTRESS FROM DAILY WEAR AND TEAR, THUS MAKING YOUR LIFESPAN LONGER WITH PROTECTION AND DURABILITY. THESE PILLOW CASES ARE A STANDARD SIZE 20"X30", AND FEATURE A 2" HEM. BEAUTIFUL BONE COLOR MATCHES OUR BONE SHEETS. THESE PILLOW CASES ARE A. Thick towels take much longer to wash and dry, and recirculate throughout the facility. COTTON T-130. 2 new SOLID WHITE STANDARD SIZE FLAT 20"X26" PILLOW CASES COMFORT FIT. Sheeting is advertised in "cut sizes", not finished sizes, therefore will vary. Think about the mill these towels are made in, and the amount of excess fibers and particulates in the air alone. Trust that Georgia Towels is here for you with whatever your textile needs should be! Thick towels take much longer to wash and dry, and recirculate throughout the facility. Think about the mill these towels are made in, and the amount of excess fibers and particulates in the air alone. LONG STAPLE COTTON IS PILL RESISTANT THROUGH OUT HEAVY BLEACHING AND MACHINE LAUNDRY PROCESSES. Thick towels take much longer to wash and dry, and recirculate throughout the facility. OUR PILLOW CASES ARE DOUBLE HEM STITCHED FOR STRENGTH AND DURABILITY THROUGHOUT. THESE PARCALE SHEETS ARE A QUEEN 60X80X12 AND FEATURE A HEM'S ON ALL 4 EDGES. BRIGHT WHITE PERCALE. Sheeting is advertised in "cut sizes", not finished sizes, therefore will vary. Think about the mill these towels are made in, and the amount of excess fibers and particulates in the air alone. Think about the mill these towels are made in, and the amount of excess fibers and particulates in the air alone. All of this will be visible initially, but will subside. This is not an indication of the towels "falling apart" in any way. 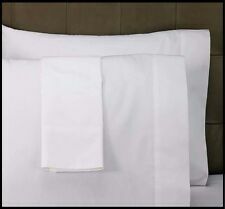 16 new white standard 20''x32'' size hotel pillow cases covers t-180 wholesale!! THESE PILLOW CASES ARE A STANDARD SIZE 20"X30", AND FEATURE A 2" HEM. THESE PILLOW CASES ARE A. Thick towels take much longer to wash and dry, and recirculate throughout the facility. About a decade ago, we decided there was a need for change in the market. 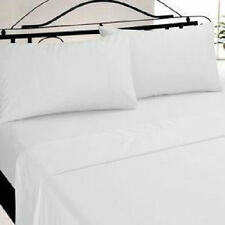 1 NEW WHITE FULL SIZE FITTED T180 THREAD COUNT SHEET. OUR SHEETS FEATURE A BLEACH SHIELD WHICH PROTECTS THE FABRIC FROM MULTIPLE WASHING'S. Sheeting is advertised in "cut sizes", not finished sizes, therefore will vary. 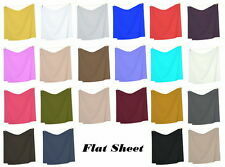 THESE SHEETS HAVE LUSTER AND A BRIGHT WHITE LOOK THESE SHEETS ARE MACHINE WASHABLE AND ARE BLEACH SAFE. 1 NEW SOLID WHITE DEEP POCKET 39X75X9 FITTED BOX SPRING COVER SHEET. We have deeply embedded roots in the textile industry in the US. SINGLE PICK TIGHT WEAVE PROVIDES A SMOOTH FEEL AND LAST 3X LONGER THAN TRADITIONAL COTTON PILLOW CASES. AND ARE OUR INDEPENDENTLY MANUFACTURED PILLOW CASES. THESE PILLOW CASES ARE A COTTON BLEND FOR STRENGTH AND DURABILITY THROUGH REPEATED WASHING'S. A STANDARD SIZE 20"X32", AND FEATURES A 2" HEM. 1 NEW 1888 MILLS PILLOW CASE, THIS SOLID WHITE PILLOW CASE IS. We have deeply embedded roots in the textile industry in the US. Textiles are in our blood sweat and tears. SINGLE PICK TIGHT WEAVE PROVIDES A SMOOTH FEEL AND LAST 3X LONGER THAN TRADITIONAL COTTON PILLOW CASES. THESE PILLOW CASES ARE A COTTON BLEND FOR STRENGTH AND DURABILITY THROUGH REPEATED WASHINGS. OUR PILLOW CASES ARE DOUBLE HEM STITCHED FOR STRENGTH AND DURABILITY THROUGHOUT. 2000 COUNT, DEEP POCKET, 4 PIECES,SHEET SET,15 COLORS,SOLID,ALL SIZES AVAILABLE.